Below you will find details about our home, Imperial Beach Bungalow located just steps away from Imperial Beach! 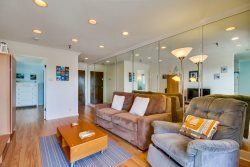 Be one of the first people to experience this beautifully remodeled beach bungalow just steps from the beach in Imperial Beach. This home, tastefully remodeled with high quality materials in 2011, has the best of both a traditional beach bungalow and all the modern things you would need in a home. Less than a block to the beach, this home is close everything including the IB pier, shops, bars, and restaurants, yet far enough to come back to a quiet sanctuary at the end of the day. Enjoy cooking family dinners in the well appointed, modern kitchen and at night around the fire pit during the cool evenings. Brand new central air conditioning, a rarity at homes by the beach. This home has everything you need to make sure you and your group has a great vacation where you will make memories that last a lifetime! This home has 2 bedrooms and 2 baths. The first/master bedroom has two queen beds, a flat screen TV and the master bathroom. The master bathroom is expansive and features a huge walk-in shower, a large vanity, and every amenity you could need. The second bedroom has a king bed and a flat screen tv. All televisions have cable. The third television is in the living room with a dvd player. There is a brand new A/C in this home and there are ceiling fans in every room as well. The second bathroom is adjacent to the second bedroom and is central to the rest of the home. The brand new bathroom has a walk-in shower. There is a queen sized sofa bed in the living room that can sleep 2 guests comfortably. The sofa isn't like a traditional sofa bed. It has a blow up mattress that inflates once the bed is open. This eliminates what is sometimes a bad night's sleep on other sofa beds. The kitchen is gorgeous with granite countertops and stainless steel appliances You and your family will love preparing meals here! The backyard has a large BBQ, a fire pit, and plenty of seating for everyone in your group. There is a shed with additional accessories such as cushions for the patio chairs and beach toys like boogie boards, umbrellas and chairs. Laundry facilities are also available on site. This home is a short drive to everything including the Gaslamp/downtown area, the famous San Diego Zoo, Seaport Village, Sea World, U.S.S. Midway, and the Safari Park. Imperial Beach is a very unique and diverse beach city. It is one of the last true beach cities and hosts such events as their annual sand castle contest and surf competition. This beach is the only beach where you can explore the beach on horseback and enjoy bird watching in the nearby estuary. This property has a parking pad for 2 cars behind the home. Street parking is available as well. 28 day minimum required for all stays. Please contact us if your dates are more or less than the required stay. Nice house , clean and very comfortable . The house was wonderful and fit our family of 7 very comfortably. The quiet beach was awesome in compared to the craziness and spring break feel of mission beach. We loved the pier and coffee/ice cream shop and being only a block away from the beach was perfect. We also loved the outdoor seating with the fireplace in the late afternoon and evenings. There are plenty of restaurants nearby that are good, but we did tend to often drive north to old town, little Italy, Gaslamp district and along the coast for many of our meals. We also had a great night just staying "home" and grilling. Loved that there were plenty of spices to use and every type of kitchen dish/utensil that we needed. We would stay again. Thank you! Your team was prompt and courteous, handled my reservation questions with ease and described the property accurately. Wow! This home was truly perfection! Close to the beach, very nicely furnished with comfy beds and every imaginable creature comfort. We had a fantastic stay and didn't want to leave! We made many wonderful memories!